Technology and gadgets are making everyone busy and distracted nowadays, with the rise of free data plans and unlimited internet connection, everyone won't move their eyes away from their mobile phones. But please try to avoid these distractions when you're outside your home, on the streets or on a public place. A CCTV footage shows a man who is "texting while walking" while crossing the road got hit by a black car. 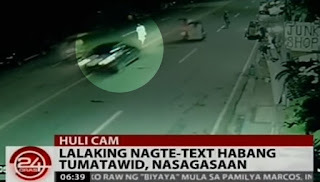 According to the news report by GMA News and Public Affairs' 24 Oras, the man reached the middle of the road when a rushing car bumped into the crossing man. The black car was traveling outside its lane. The car stopped the nurse driver approached the victim and called the ambulance. Unfortunately, there's no ambulance available so the crowd decided to help the victim to get inside the nurse's car and bring him to the hospital. This should be a reminder for everyone to be alert in crossing the streets and always follow the traffic rules.